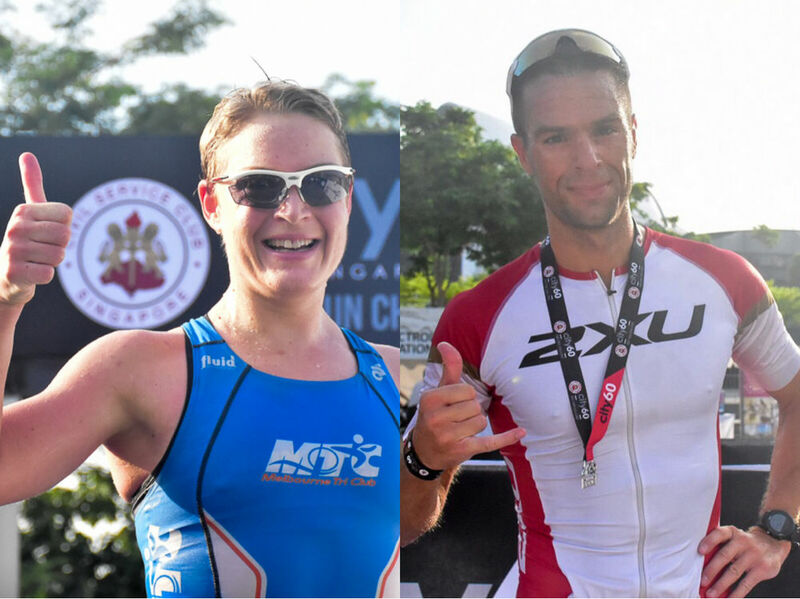 The CSC City60 Bike-Run Challenge made a spectacular entry onto the Singapore endurance scene yesterday, as Alexandre Delort and Jennifer Zenker put in commanding performances to walk away with the top prizes in the shadow of the National Stadium. The run-bike-run duathlon was the first multisports event to grace the Singapore SportsHub and the majestic stadium and its surroundings provided the perfect backdrop for a superb morning of racing. The main item on the race card was the headlining City60 contest, with the competitors set the task of a 46km bike ride sandwiched between two 7km runs, to give a total of 60km in distance. The naming theme continued on the undercard, with the numbers in the City30, City15 and City6 events indicating the total distance cycled and run. An elite wave of competitors kicked the CSC City60 Bike-Run Challenge off at 6am. Ahead lay a scenic out-and-back run course that hugged the Kallang River for almost the entirety of its 7km length. Street and building lights from the SportsHub and the Tanjung Rhu condominiums lit the way for the runners, but the best illumination was provided by the lights shining across the water from the city, with the Singapore Flyer, Marina Bay Sands and the Barrage providing a truly spectacular setting. The running from the elites was pretty spectacular too. Delort, fresh from his win at the 2017 Singapore Triathlon last month, led the charge, with only Singapore’s Andreas Toh able to match the Frenchman’s speed on the first leg. The pair had a handy lead heading into transition but upon leaving T1 it didn’t take Delort too long to pull away from Toh on the flat, fast and completely closed bike course, which headed straight into the city via the Nicoll Highway. A left-turn off the main arterial road linking eastern Singapore and the CBD took the riders onto a sweeping section at the F1 Pits area and yet more impressive views of the city skyline. While Toh faded somewhat on the bike, other competitors stepped up to the challenge, with the trio of Colin Mitchell, Mark Jansen and Antoine Loucheux making sure Delort couldn’t afford to take his foot off the gas at all on the four-lap middle segment. The frontrunner completed the bike leg with a 30-second lead on the closely bunched chasers but any hope the three might have had on catching Delort was soon dashed as the Frenchman pulled away with another impressive run. Delort broke the tape and received the acclaim of the big crowd at the riverside finish line in a time of 2 hours, 2 minutes and 6 seconds. Behind, an exciting contest for second place was unfolding. Mitchell from Germany eventually took that honour, 54 seconds behind Delort and 7 seconds ahead of another Frenchman Loucheux. Delort was understandably happy with his victory, which didn’t come as a complete surprise to him. “I hoped to win today. After my victory in the Singapore Triathlon in September I hoped to win today also. But it’s not easy to win,” he said. Delort was impressed with the City60 course, especially the “very, very nice” bike loop, but he admitted he had to work hard on that second leg. Zenker, who has been the preeminent local female athlete in 2017, continued that theme with another dominating performance in winning the women’s race. The German led by just under a minute after the opening run leg from Singapore’s Baoying Lim but steadily stretched that lead on each lap of the bike course, before finishing the task off with an assured run on the final leg of the race. Zenker’s total time was 2 hours, 12 minutes and 2 seconds, which gave her a winning margin of over 12 minutes from Lim. Fellow Singaporean Brenda Fong closed out the overall female podium in third. Does Zenker ever get bored of winning? “No, not all. This one was also very important for me, because my last race overseas didn’t go well. So I had a lot of self-doubt to be honest, so my training was really hard. No one knew that but for me it was very important to get the win, so not tired of winning,” a laughing Zenker said. Like Delort, Zenker was impressed by the course, especially the bike leg. “The whole course was very nice. The run was pretty straight forward, but I really liked the bike. I mean having closed roads is obviously always very special. You need the first loop to know where to take the corners and then from the second lap you really know how fast you can go,” she said. While the elite athletes may get the headlines, like all races put on by event organiser MetaSport, the CSC City60 Bike-Run Challenge was aimed at the entire multisports community. The City60, City30, City15 and City6 contests provided opportunities for everybody to participate, from young and old to somewhere in between, to race-hardened veterans and complete rookies. The newbies would no doubt be impressed by the organisation during the race and by the offerings at the race village. Situated right next to the riverside finish line and in the shadows of the National Stadium, the shaded, garden-like area had booths providing free post-race massages, compression recovery, ice-cold drinks and more, as well as an enhanced live results service featuring a photo booth displaying each individual’s finishing time. With the headline sponsor of the event being the Civil Service Club of Singapore, each of yesterday’s races also had dedicated individual rankings for public officers, as well as a team contest to find the best government agency. That honour went to the Housing and Development Board, better known by its HDB acronym. The CSC City60 Bike-Run also featured two side competitions, the Sprint Challenge and the Negative Split Challenge. The former sought to seek the fastest cyclist over a marked 1km stretch of the Nicoll Highway. That honour went to overall race winner Delort, who covered the distance at an impressive speed of 45.4kph. The Negative Split Challenge tasked the competitors with trying to go 60 seconds faster on their second run from the first. Any negative split is tough in a duathlon, so big kudos to challenge winner Jenny Neuse for being the closest to the target, her second leg being 56 seconds faster. The inaugural CSC City60 Bike-Run Challenge was a big success and will return in October 2018. For full results of the 2017 race, go to http://city60bikerun.com/ .